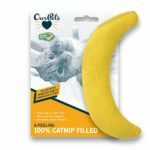 The most rewarding training experience for you and your cat! We’ve seen everything from Persians to Tabby cats running on our wheel, while high energy breeds like Bengals and Sphynx tend to learn the easiest. Please do not buy this wheel if you are not willing to train your cat; some cats take to the wheel naturally, but others will require time to get accustomed to the wheel. In some cases it takes a full month for a cat to learn to walk or run on a wheel. These are Generation 4 wheels, featuring fewer parts and modified roller blade wheels for greater stability. They are constructed of 100% recycled plastics for a lightweight but sturdy design capable of supporting up to 25 lbs. The running surface uses EVA foam to cushion the cat’s steps and prevent claws from catching. Wheels can be easily wiped down with a wet towel or hosed down for quick cleaning. A bored cat is an unhappy cat, and without a stimulating environment, cats can get bored quickly. That’s why we created our One Fast Cat exercise wheel. The wheel gives cats a safe outlet for energy that would otherwise manifest in destructive or unwanted behaviors, like clawing at the furniture, racing through the halls, or harassing their humans. Being entirely cat-driven, the wheel needs no batteries or power source. 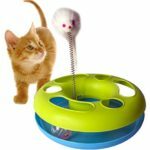 Some training will be required-cats do not have a natural instinct to run on a wheel-but once your cat learns how to use their new toy, they’ll hop on it throughout the day, usually going for a quick sprint or two every few hours. In addition to burning off excess energy, the wheel can help burn off extra calories, too. It may take more time and dedication to get a chubby cat running on a regular basis, but once they do, you’ll start to see them slim down into their more svelte selves. 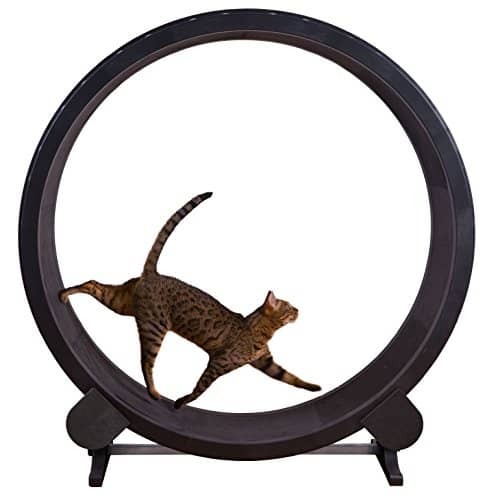 A One Fast Cat exercise wheel is an excellent tool for keeping your cat happy and healthy. For most cats, it takes time and patience for them to start using the wheel. While some cats may jump right on and go, many others will need some training before they know how to use their new toy (check out our training video for tips). We understand that it can take a couple weeks, sometimes even a month of daily training, before a cat starts using the wheel on their own. To give you time to work with your cat on the wheel, we allow returns on our wheels for up to 30 days after receipt. If the wheel just doesn’t work out for your cat, you can contact us to start a return. Wheels must be returned in the original box. We issue a full refund and a prepaid return label for orders in the continental USA. For international or overseas orders, please be aware that we do not provide return labels and shipping fees are nonrefundable. Assembly is required for this wheel, and the completed product is large (48″ diameter). Please review our assembly video online before purchasing to confirm that you will be able to put this item together. Less handy individuals may require the assistance of a friend or family member to complete assembly of the wheel. FREE RETURNS: We accept returns for up to 30 days after receipt of the wheel to ensure that you have time to train your cat to the wheel. We provide a full refund and a pre-paid return label for orders in the continental US. Wheels must be returned in original box. Shipping fees will apply for international or overseas orders.